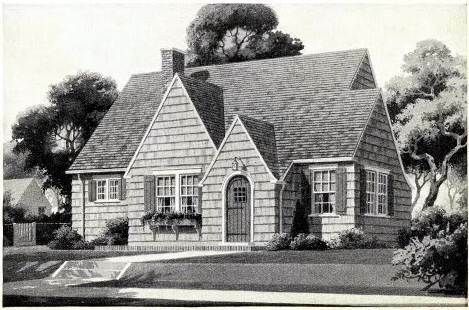 Sears Wilmore, from the 1938 catalog. The Sears Wilmore was sold from 1933 to 1940. The assessor says that the Wilmore in Lombard was built in 1940, which is within the realm of possibility. The address on this house switched sometime in the 1950's which makes it impossible for me to determine the build date or the original owners. The bellcast roof on the side of the Wilmore is an identifying feature. The Wilmore in Lombard has a standard door from Sears with a nine-pane window. The 1939 Sears merchandise catalog shows happy newlyweds entering their Sears Wilmore.